Our Lady of Lourdes Shrine in Euclid, Ohio - BLIND FAITH LIVE ! Real People. Real Miracles.BLIND FAITH LIVE ! Real People. Real Miracles. 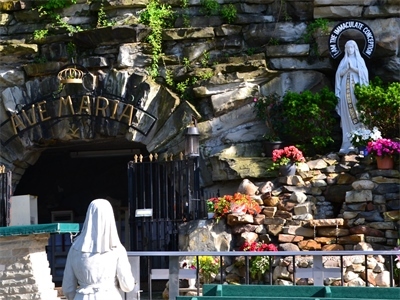 Since publishing Episode 100, Blessed Mother Mary Appears at Local Shrine, many have contacted us for additional information about the Shrine and how to get Sacred Holy Water if you live out of town. The Shrine is maintained by the Sisters of the Most Holy Trinity and below is their contact information. You may also visit their website for a calendar of events and additional information. Calling hours for the Sisters of the Most Holy Trinity is 8:00 am – 9:00 pm daily. The Shrine is open daily, 7:00 am to dusk. Mass times, rosaries and stations are offered throughout the week and times vary depending on season. Please refer to their website. This entry was posted in Uncategorized and tagged Blessed Mother by Philip Keller. Bookmark the permalink.